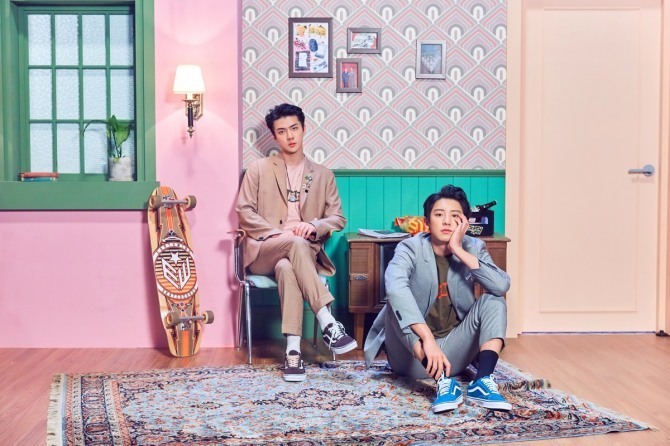 Chanyeol and Sehun of EXO dropped a digital single, “We Young,” at 6 p.m. Friday. The EXO duo’s joint work is part of S.M. Entertainment’s digital music project, “STATION X 0,” which kicked off with Taeyeon’s “Page 0” in August. The single was previously performed at EXO’s Seoul concert in July, which was well-received by fans. Fellow EXO member Baekhyun collaborated with rapper Loco prior to Chanyeol and Sehun’s project. Watch the music video at https://www.vlive.tv/video/88982. Black Pink dropped a video message on Friday encouraging fans to come watch the band at its upcoming concert in Seoul. “Black Pink 2018 Tour ‘In Your Area’ Seoul will be held on Nov. 10 and 11 at Olympic Gymnastics Arena,” announced the band. Watch Black Pink’s message at https://www.vlive.tv/video/88862. “Girls for Rest,” a reality show featuring the five members of Oh! GG, has already reached its 30th episode. In next week’s episode, the Oh! GG members arrive at a huge mansion in Antibes, a Mediterranean resort located in southeastern France. “This is unreal,” Sunny marveled. They enjoyed a candlelit dinner at the beach, with a magnificent view. Watch the trailer at https://www.vlive.tv/video/88557.